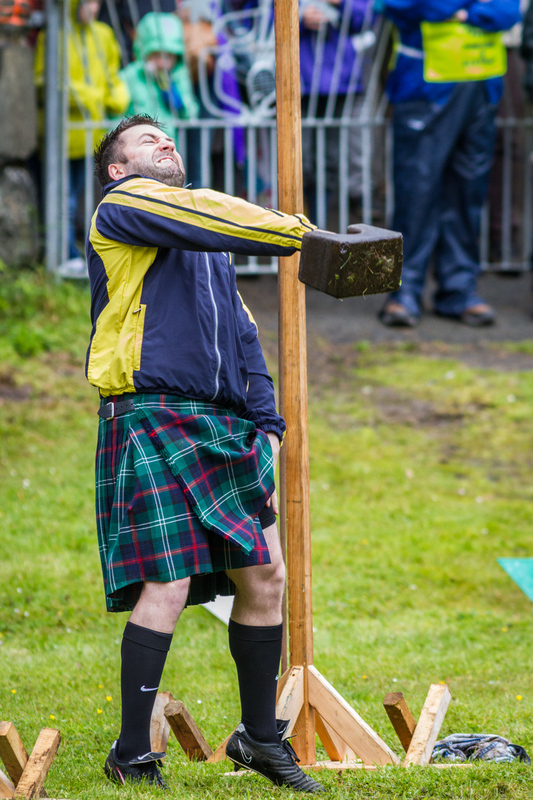 Yesterday was the 138th Isle of Skye Highland games, and considering the number of years I have been visiting and working in Scotland also my first time at a Highland games! I arrived in the morning to find deceptively small crowds (then again it was only 9.30am) and followed the Isle of Skye pipe band as they led the spectators from the town square over to the games field. The day began with the local competitions (events that are open to anyone living on Skye or the immediate mainland), and with cash prizes for 1st, 2nd, 3rd & 4th places I may have to consider entering next year! Throughout the day the pipe band paraded around the grounds playing a selection of traditional tunes and reels. Unfortunately continuing poor weather meant that most of the dancing had been moved indoors though we were treated to a brief show. The main show of course was the heavy athletes and the big throwing events – by this point the crowds had swelled with little room for manoeuvring. Due to everything running behind schedule by about an hour I missed the quintessential events such as tossing the caber, as my family were visiting the Island. I decided to take them out on one of the boat trips to see if we could spot any wildlife. The weather really closed in but despite this we were still treated to good views of a pair of white-tailed eagles, seals and harbour porpoise – a lovely end to an eventful day.